We really enjoyed our time at the Santa Monica Summer Project, though seemingly short, we were so blessed to be part of it! The summer project environment is just amazing, and entirely transformational. In just a short period of time, God is so faithful to knit hearts together, to reveal, correct, and heal areas of sin, and to enflame ours’ and the students’ hearts in our desire to know God more deeply and live out our faith more naturally. Carrie and I had a bit of hesitation before going into the summer, doubting that it was enough of a time-frame for any significant growth or change to happen. 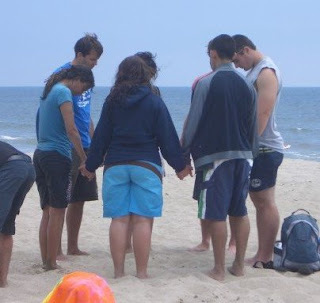 But, as God always does, He worked in amazing ways, really enabling us to encourage and bless those who we were discipling for the summer, and He gave us the energy and passion to pursue and know the staff and students we were with. Just as Paul was an amazing lover of people, truly pouring his life out to new groups of people in each new town he would visit, God has shown us that we can do the same with the strength of Jesus. And, God will be so faithful to bless us as we are obedient to love His bride in this selfless way. I really believe God wants us to learn this so that we will serve and love those around us no matter who we’re with and no matter how long we expect to be with them. So, we (the summer project staff) left Santa Monica and handed the project over to the students last week, to lead everything themselves; it’s so great to see students step up into leadership, being stretched to do things they never thought they could. Pray for them (for effectiveness and passion in evangelism, and for softness of their hearts in gaining a vision for their role in God’s Kingdom here) as they continue on this “project” through August 10th. Serving with Campus Crusade has been an amazing experience for us. We have really been blessed by the staff we’ve gotten to work with (both in East Asia and in SLO), and we’ve gained a new perspective on our life having spent these two years in this ministry. We are so grateful for the opportunity we’ve had to serve and be served in this way, and we recognize that we couldn't have done this without the financial commitments some of you have made, and for the faithfulness with which you’ve prayed for us. With each discipleship appointment, each time we went out to share our faith, even each staff meeting we had to discuss strategy to reach the campus for Christ, we were covered by your prayers and filled with blessings from the partnership we have had with you. We don’t take this reality lightly. You have had a significant impact in literally reaching the world for Christ, not to mention our own shift in perspective - allowing our life purpose to be wholly focused on the Great Commission. The course and direction of our life has been altered as a result of being involved with Campus Crusade through college, and working for two years in vocational ministry. We believe that many of the students we’ve worked with can say the same. Thanks so much to those of you who have been part of this journey with us! In the last update, we explained a bit of what we’ll be doing next. Greg will be working for Silk Road Business Group, which is a new San Luis Obispo based company doing new business development with an accompanying missions-purpose. Now that we’re home from summer project, Carrie is in process of looking for a job in SLO. Your prayers for this (figuring out what to do and finding that job) would be greatly appreciated! P.S. Cute Picture of you two! What's So Amazing About Grace? :: Stories of grace that never get old no matter how many times I read it. Romans :: Challenge and encouragement. The Economist :: The magazine with ridiculously good insight and forethought. "How to Save a Life"